For Lexington, KY drivers in search of luxurious interior design and premium features, the 2019 Land Rover Discovery Sport is sure to impress. 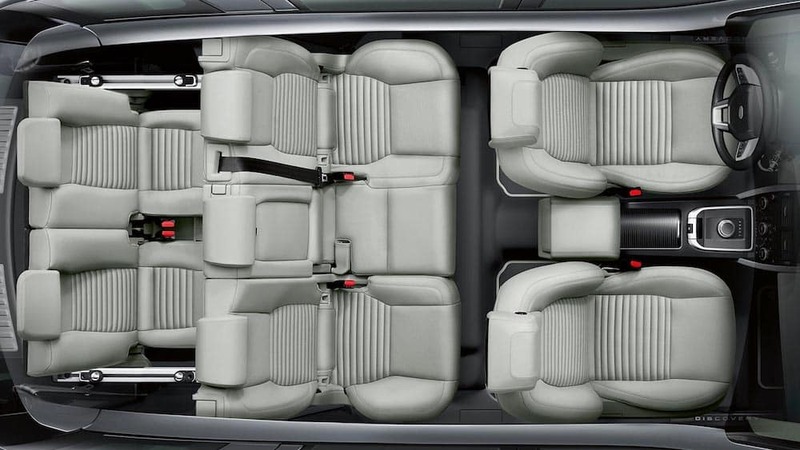 Choose the optional third row to increase the seating capacity and take the whole family for a drive, and enjoy refined touches like the available perforated leather steering wheel and customizable ambient lighting. Learn more about the Land Rover Discovery Sport interior dimensions and features today with our team at Land Rover Cincinnati. Technology – Use the standard 8″ touchscreen to access select smartphone apps, and set the mood of your drive with the configurable interior ambient lighting system. Audio – Choose between a 10-speaker Land Rover Enhanced Sound System or a 11-speaker Meridian Sound System. Enjoy concert quality audio on the streets of Mason. Seating – Settle in comfortably when you select perforated grained leather, partial leather, or windsor leather seats All models are equipped with 60/40 second-row seats with recline and slide function. Trim – The details of the Land Rover Discovery Sport SUV are sure to make an impact. Select models include ebony headlining, illuminated aluminum front tread plates, and a dark grey brushed aluminum center console. For more information about the new Land Rover Discovery Sport, you can rely on our team at Land Rover Cincinnati near Columbus. We’ll be happy to answer any of your questions, whether they’re about Discovery Sport towing capacity, Land Rover InControl® or our favorite cultural attractions in the area. Contact us today!